What kinds of people were these Atlanteans and how did their bodies differ from those of today? What did Cayce mean when he described Atlanteans as “thought people? Did they leave records of their civilization? What happened to Atlantis? Where is it now? Could you be a reincarnated Atlantean? • Why did the Atlanteans choose Egypt and Yucatan to colonize? • Where did Cayce say we could find evidence of Atlantis? • Is there a possibility that the ancient Egyptian and Mayan gods were actually Atlanteans? • Who was Ra Ta? 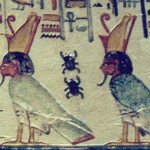 Who was Hept-Supht, and why did he leave Atlantis for Egypt? • How does Cayce describe the root races? Is his prediction of the fifth root race tied to Atlantis? Carol Chapman has traveled four times to Yucatan and once to Egypt using the Edgar Cayce readings and her own past life regression memories of Atlantis as a guide. She searched for indications of Atlantean visitors in these lands. She created the Edgar Cayce Divine in Nature Calendars and is also an independent filmmaker who produced the End of the World 2012 Movie and the travelogue, Yucatan Travel: Cancun to Chichen Itza. She is an inspirational speaker, using participatory workshops and audio-visual aids in her seminars. Her style is fun and informative as she educates and entertains audiences in the U.S. and Canada. Carol wrote of her adventures in When We Were Gods and Arrival of the Gods in Egypt. She has been featured on Art Bell/George Noory’s Coast-to-Coast AM and is the CEO of the publishing company SunTopaz LLC. She studied photography and filmmaking at Ryerson University in Toronto and has a Bachelors Degree in Journalism from Prescott College in Arizona.